The expert is martingale. Trading volume, used for opening position, depends on previous transaction results. 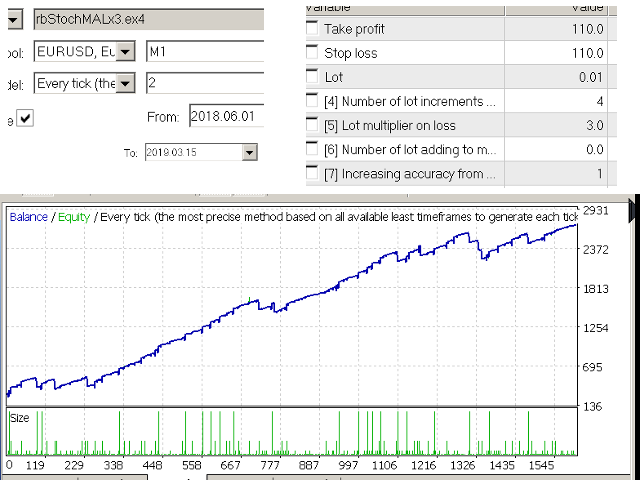 The unprofitable order is compensated by increasing volume of new one, wherein “Takeprofit” = “Stoploss” is recommended. But can work without martingale. The main indicator for determination the entry point is Stochastic. To clarify the entry point(“ Number of…” is more, than  Increasing entre…), the trend defined by moving averages "MA1 slow" and "MA2 middle", is used, as well as "MACD" when the corresponding setting is on. If order was closed at a loss and this parameter is not equal to 0, then volume of the next is Lot=Current Lot* “ Lot mult…”+Lot*" ... of lot adding...". If is a loss again, then is multiplied once more. If order was closed with profit or “ Number of…” is exhausted, then volume of the next order returns to Lot setting. Example: The first loss is lot=0,01*2+0.01*1=0,03, the second loss is 0,03*2+0.01*1=0,07, third loss is 0,07*2=0,15, next 0,31, 0.63 and the next one is 0,01. 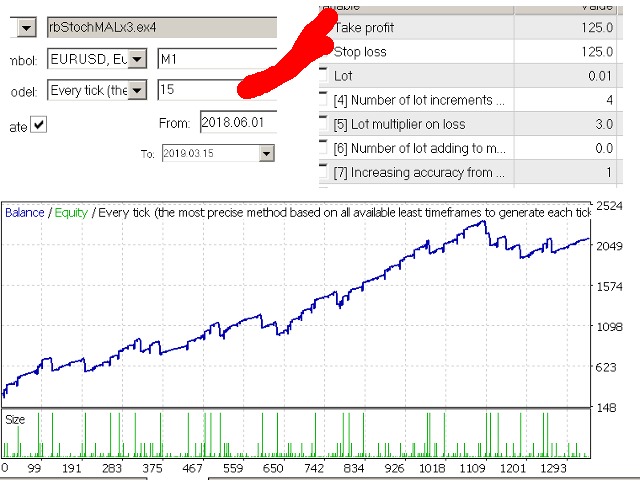 Or: the first loss is lot=0,03 and profit is the next order will open with volume equal to 0,01. If this setting is equal to 0, than volume will not increase. It is described in the previous parameter. If it’s 0 or 1, than order volume will not increase. 2 or 3 recommended. See " Number of lot increments on loss". Recomended 1 if " ..." =2 and 0 if =3. It’s number of consecutive losing orders, after which additional indicators turn on to determine the entry point. Trend is determined by MA1 and MA2. It filters or confirms signals from Stochastic by oscillator MACD( if it’s enable). This option works in conjunction with . To disable the refinement algorithm, parameter  must be greater than . If you want the clarification to work constantly, then set the parameter  to '-1'. If volume increase is not needed, then  should be equal to 0. It makes sense when " Increasing entry accuracy from N loss" is enable. Enable (true) or disable (false) the MACD indicator to clarify the entry point. It characterizes the angle of intersection of the main and signal lines. It is recommended to select in the range of 0.5-0.01. The smaller the number, the greater the number of are opening deals. The larger the number, the more accurately the signal is determined. It’s noticed, it’s depend of broker. It’s a parameter of Stochastic. Recommended values are 2, 5, 7, 9. The smaller the number, the more signals. This section contains the standard settings of the indicators. "upper" and "lower" of stochastic define areas, where the intersection of the main and signal lines give a signal to sell or buy. МА1, МА2 and МА3 are trend indicators of Moving Average. On some accounts, orders are opened only with prices multiple 0,00005, then the parameter should be set to 5, or 0.00010 - then 10. During execution of opening, closing and modifying commands, the price may change. Here is indicated how many points the change is allowed. It’s date and time after which it is forbidden to open orders. The expert remains in work, and in order to continue trading it is enough to change this date. Format is YYYY.MM.DD HHH: MM. It is useful to stop in front of very volatile news, especially political. 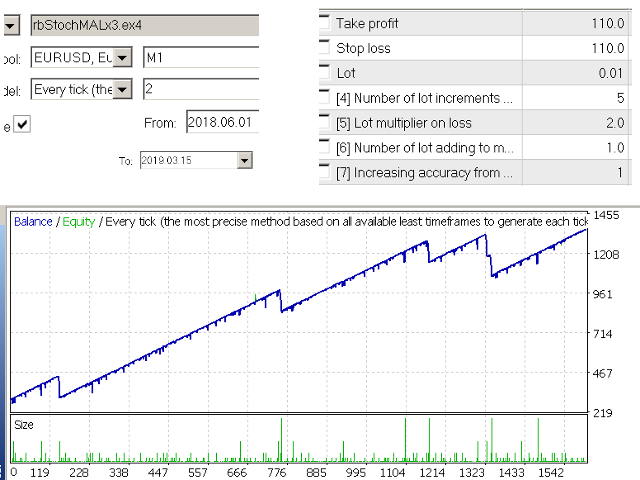 If enabled (true) and the price is at the distance of the spread from the takeprofit and trend defined by MA3 and MA2 corresponds to the type of order, then takeprofit moves towards increasing the profit by «Trailing Size» of points, and stop loss is set and moves on MA2. Expert is designed for trading with an increase in the volume, on a five-digit account, instrument EUR / USD with a period of M1. It is important to correct choose the stop loss and take profit. All parameters can be changed without restarting. In addition to EUR / USD, you can work with GBP / USD and USD / JPY. There is no specific connection with the five-digit score, you can also try on a four-digit chart. The same is true for timeframe. 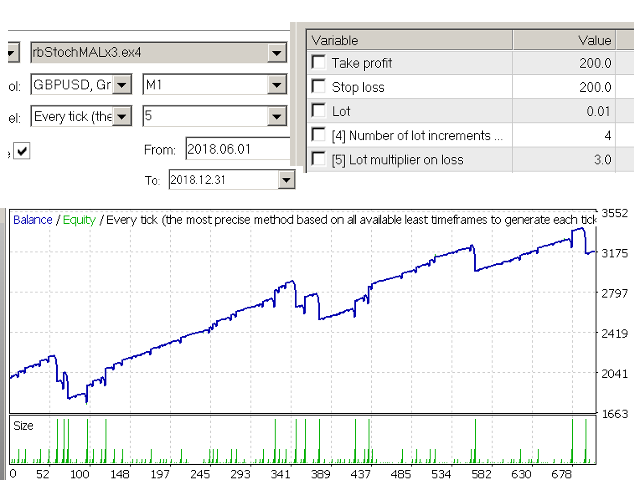 Added martingale setting  Number of lot adding to multiplied. =5, =2, =1 for mininal risk.